Order Brewferm Oud Bruin Beer Kit from the Stirling Homebrew Shop UK. 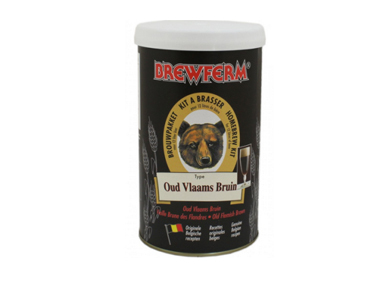 Buy Brewferm Oud Bruin Beer Kit - makes 12 litres and other Beer Kits & Cider Kits safely online in the UK. This Belgian beer is a very aromatic, full bodied, Belgian brown ale with licorice notes and a moderate alcohol content. What a fun way to make your own beer at home! Where to buy Brewferm Oud Bruin Beer Kit safely online? Shop at the Stirling Homebrew Shop if you are wondering where you can buy Brewferm Oud Bruin Beer Kit - makes 12 litres safely online in the United Kingdom. Brewferm Oud Bruin Beer Kit - Brewferm Oud Bruin Beer Kit - makes 12 litres in Beer Kits & Cider Kits and Homebrew.